I saw a hashtag on Twitter recently - #WeFo, as in West Footscray. This prompted much undignified snorting at the time. SoHo and TriBeCa, watch out, WeFo is burning up - bringing velour blankets and split peas to all the hipsters! A new opening, however, is making me eat my words, and with pleasure, too. Besito is just three days old today, a cafe that serves Five Senses coffee and a really exciting Colombian-informed menu. 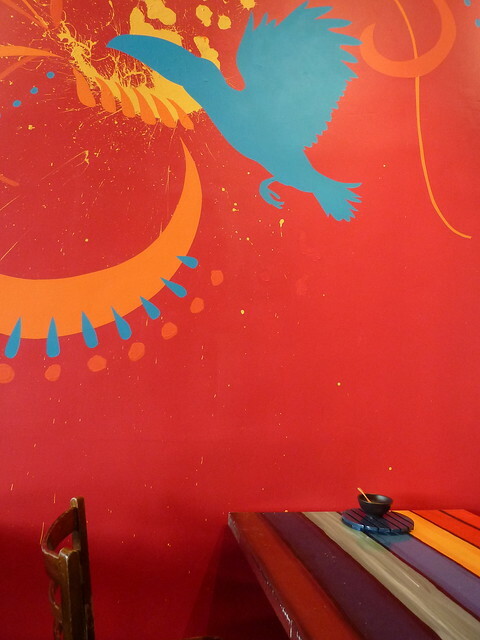 The colours blossom like a tropical flower inside, with joyous, rustic rainbow tables and an effervescent mural on the walls bursting with colourful silhouettes of rainforest birds. 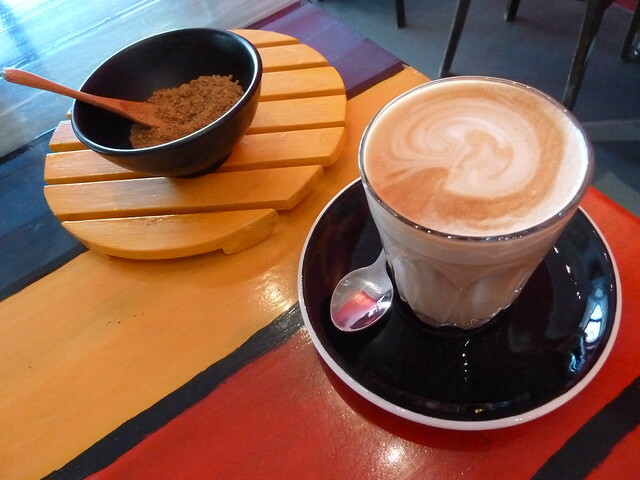 Uncompromisingly great coffee, coaxed from a Synesso machine. They use Five Senses' Dark Horse blend never more than 6 to 12 days post roasting. The sugar is panela, evaporated cane juice, ie, totally unrefined sugar. It actually has healthy qualities such as trace minerals compared to regular sugar. The lovely Colombian waiter explained that back home, a Colombian version of Gatorade is panela and lemon juice mixed with water. 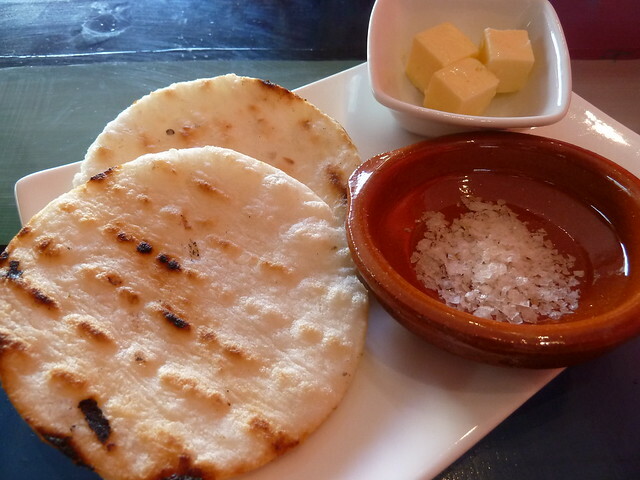 These are arepas which are a Colombian staple. They are thick pancakes made from low-processed whole white corn. They're not made from a flour as are tortillas and pupusas but more of a meal, similar to polenta I believe. The right way to eat these is to nick with your knife all over and then smoosh with heaps of butter, letting it meld with the soft middle. They were delish, perfect with the great quality butter and salt flakes that melted like snowflakes on the tongue. There is so much to try on the menu, from intriguing breakfast dishes such as changua, free range eggs poached in coriander-infused milk, to lots of little bites like smashed chickpeas or things with manchego cheese. 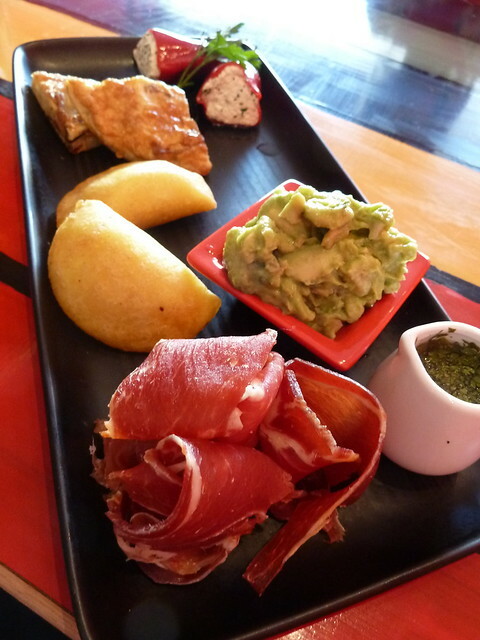 This tasting plate seemed a good place to start. The jamon (similar to prosciutto) was divine, with multidimensional saltiness and savoury umami hum. Gorgeous creamy guacamole melted in the mouth while the fat little potato-stuffed empanadas were great with the zesty coriander salsa dressing. The Spanish tortilla (egg and potato omelette) was excellent while light queso cheese-filled peppers were slippery and delicious. That shot of happiness is arequipe, fudgy Colombian caramel sauce made from fresh milk, served here with a raft of chocolate ganache. 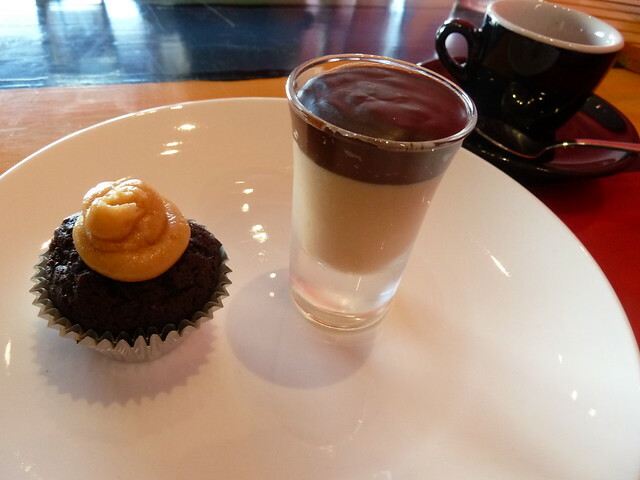 Mini salted caramel cakes are next. We loved the swirl of luscious caramel on top but the cake was slightly on the dry side - it's hard to get these tiny cakes still moist. As well as espresso, they serve filter coffee with regularly-changing single origins (currently Colombian, of course!) I'm really getting into filter. It's like a tea, and taken without sugar and milk, so many more floral notes come out in the coffee and you can relax languidly into a cup or two in a way you can't with a punch-in-the-face short black. This is probably funny from me who photobombed them on their second day, but GO SLOW - they are very new and still getting settled. Be neighbourly and just be patient. A liquor licence is coming soon and then they will be opening for WINE and NIBBLY THINGS in the EVENINGS. WeFo, I'm sorry I doubted you. ¡Bienvenido to the neighbourhood, Besito! In the eastern vs western suburbs friendly rivalry, we might score a goal in the injera stakes, but they lord it over us with yum cha. At least we have at least one great example in Gold Leaf Sunshine. This is our favourite local place for the yummy stuff. My earlier post about Gold Leaf Sunshine was kind of lukewarm, but we've been many, many times since and always love it. 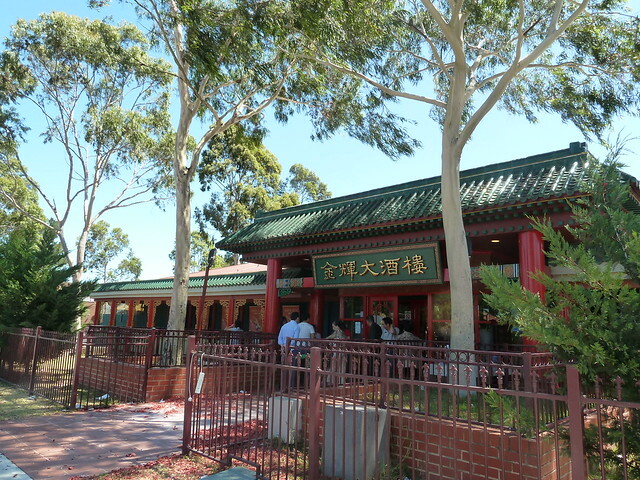 It reminds me of a temple from the outside, reclining peacefully under the gum trees. This day we wandered in to a full lion dance ceremony celebrating Chinese New Year, complete with handsome young men banging drums, firecrackers popping crazily and children being terrified, made even more awesome by the fact it was Australia Day. One reason I love Gold Leaf is their unusual and unique yum cha items. These soft "spring rolls" were fantastic, pliable flat rice noodles curled around a fresh prawn, dried mushroom and tender bamboo shoot filling. 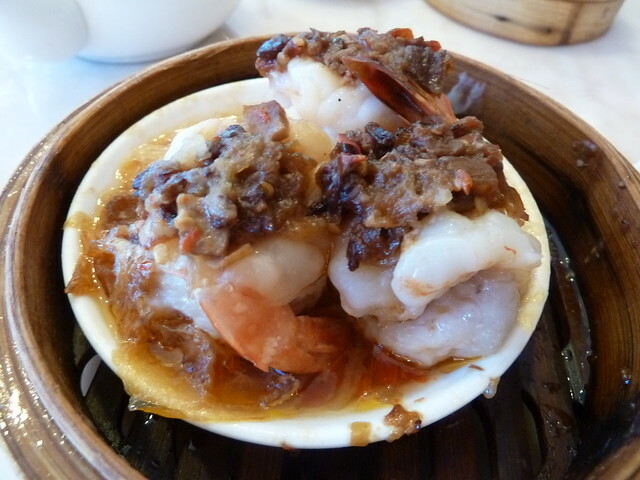 Bouncy butterflied prawns with a tingling umami hit of XO sauce, rich with dried seafood and Chinese air-dried ham. Sweet pucks of prawny mince on tender silken tofu discs in a very light thickened stock. 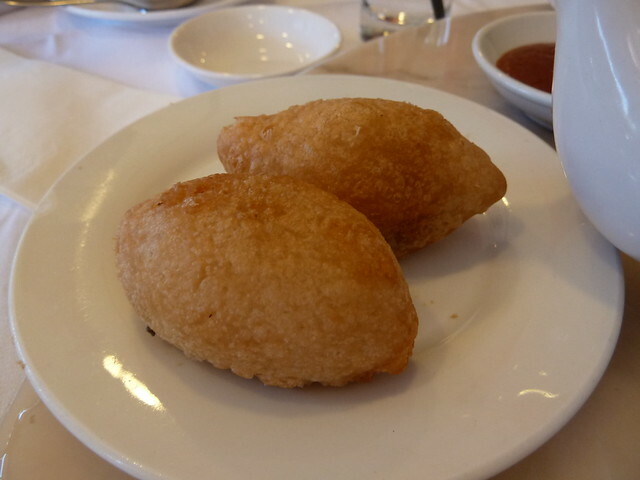 These were deep-fried har gow-like prawn-stuffed dumplings, but with a different wrapper that was pleasantly thick, crispy on the outside but fluffy on the inside. They were fantastic! 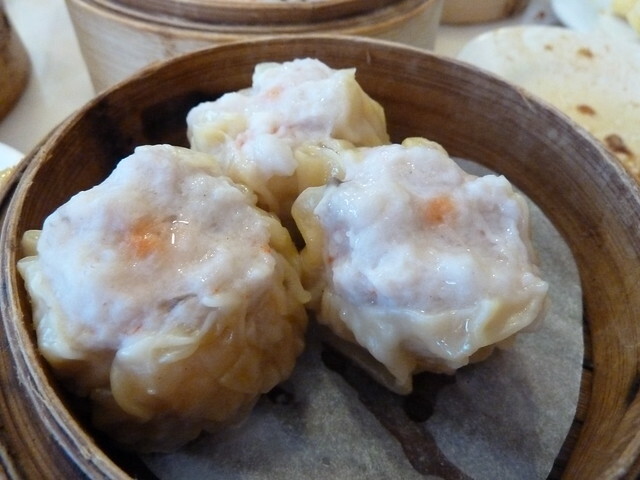 Getting back to the classic hits rotation now - big, porky siu mai with lots of juice for contented dribbling. Yes, I know it is bogan but we call these football dumplings...and yes, you do get three here - the plate got tackled the minute it was set down. Rightly so too as they were pretty unreal. 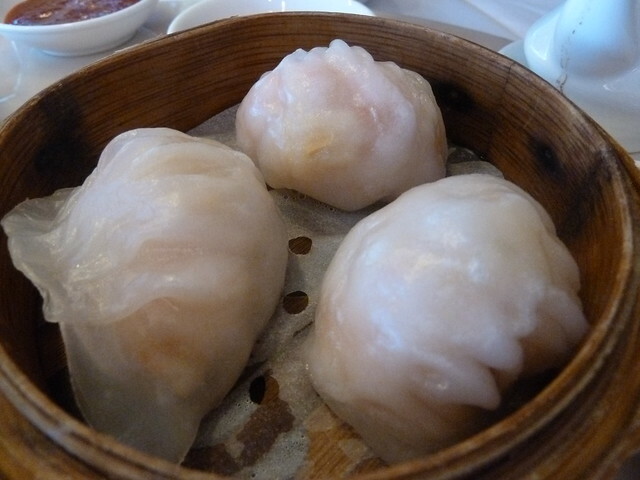 They are properly called ham sui gok and are made with a sticky dough enclosing a pork mince and mushroom filling. 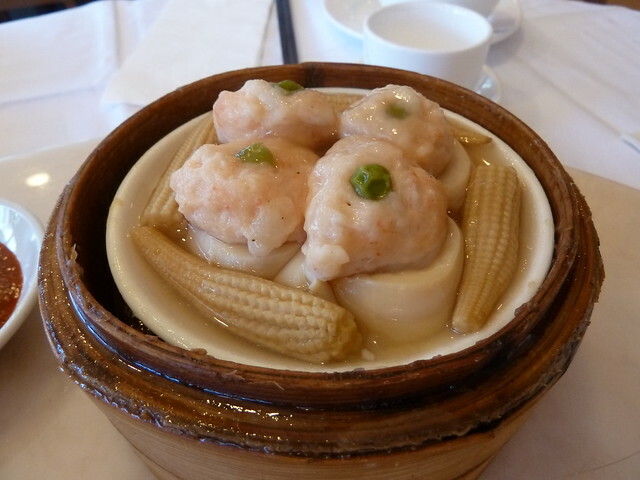 The yellow dumplings' above more virtuous cousin - har gow, steamed prawn dumplings with a little bamboo shoot. These were quite good. 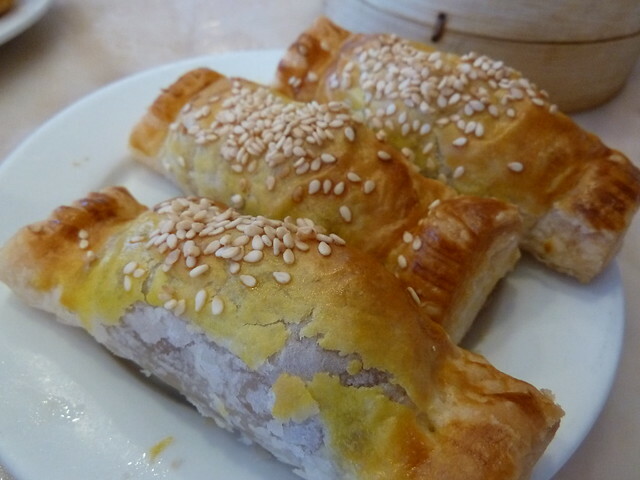 Another favourite, totally flaky pastry that melts on your fingertips, filled with warm chopped BBQ pork. 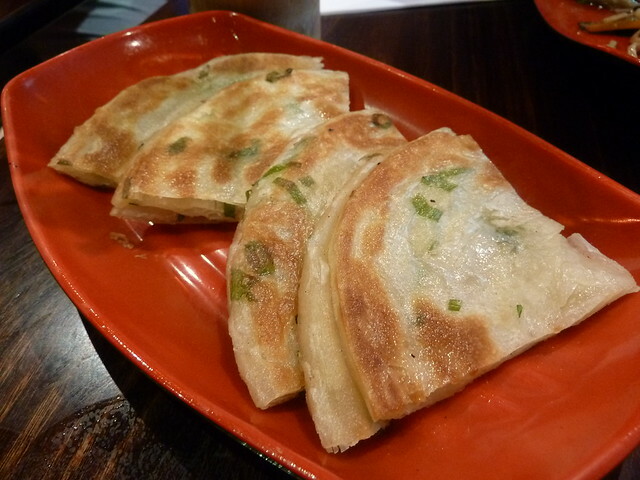 Master Restaurant in central Footscray do these incredibly well too, as well as blind taste test-winning BBQ pork buns. 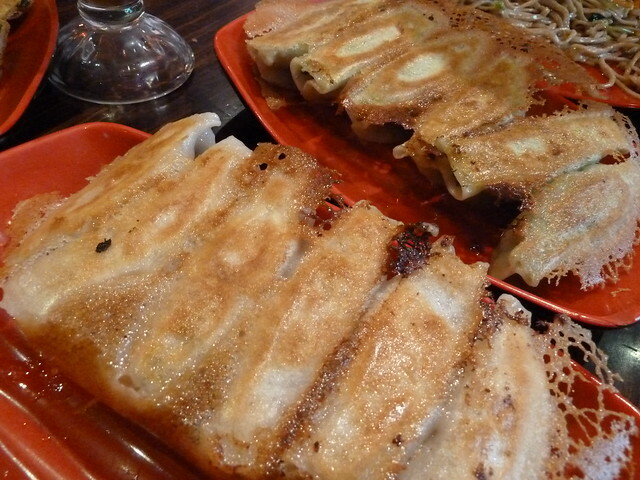 Cheong fun are thickish, wide rice noodle sheets gently flopped around a filling such as prawns, long Chinese donut or BBQ pork. 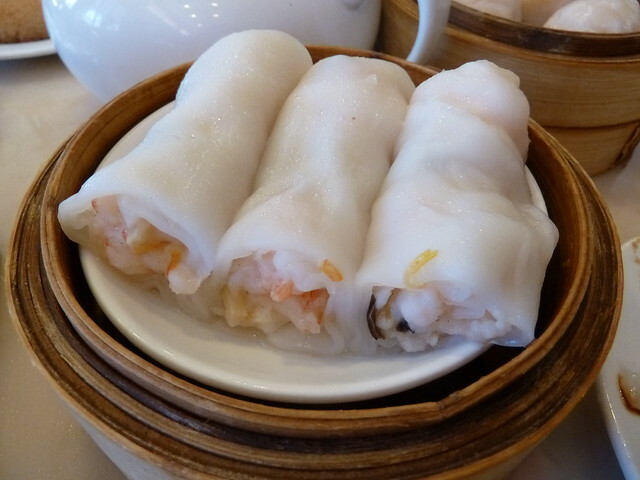 These prawn ones are my favourite - they're so slippery and delicate with a thin, sweet sauce that's just divine. Gold Leaf's were just slighly on the mushy side but still delish. Enter the evil twin! 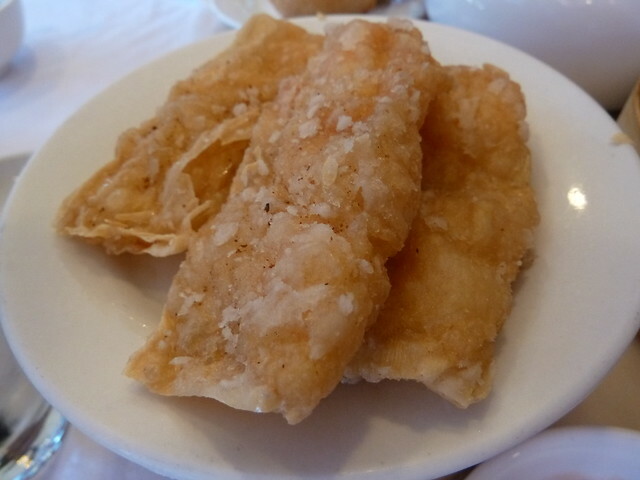 While these also contain prawns, they're made with beancurd skin instaed of rice noodles and are lusciously deep fried for instant crack-tification. 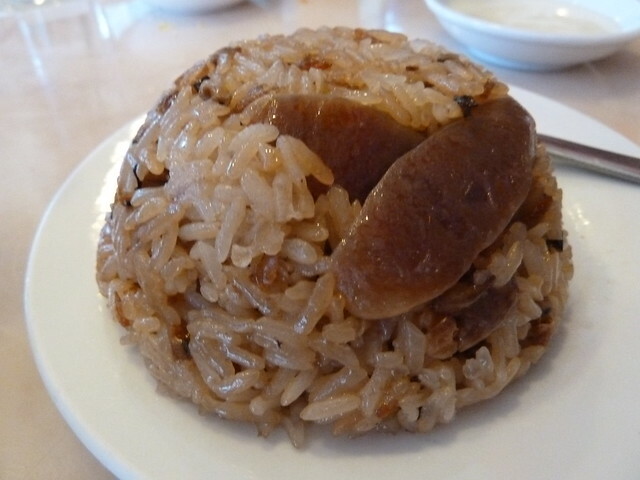 The only speed hump in the meal was this rather bland sticky rice. 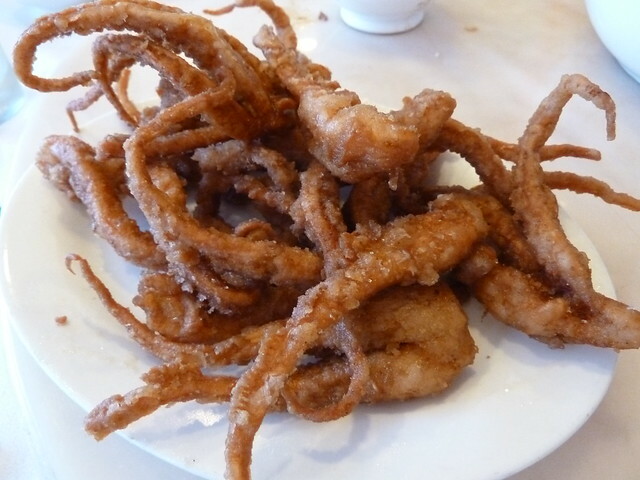 Just perfect fried squid legs with tender thighs snaking down to snappy little ends, dusted all over with coarse salty crystals. 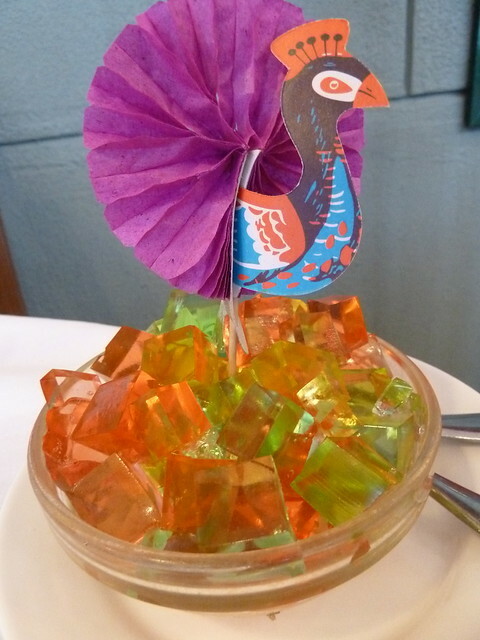 Personally I love the stacked jellies with fruit and coconut layers, but this quivering bowl of rainbow iridescence is a childlike pleasure. 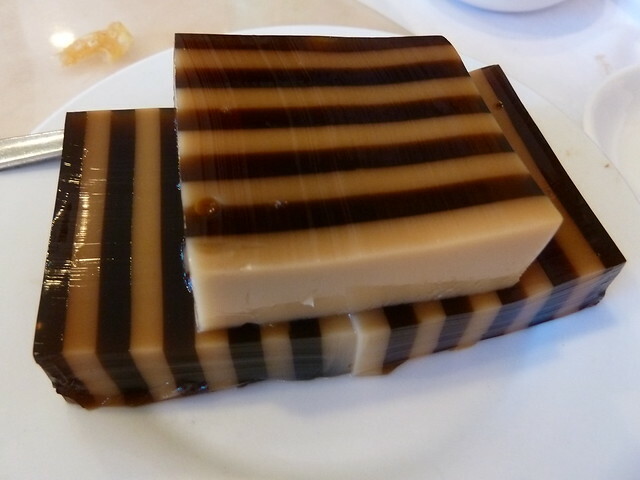 I wasn't a fan of this coffee jelly - it tasted suspiciously like instant. I know these as banh bao chi. You can buy them from To's in Little Saigon in white and green hues, but these ones were the best I've had. 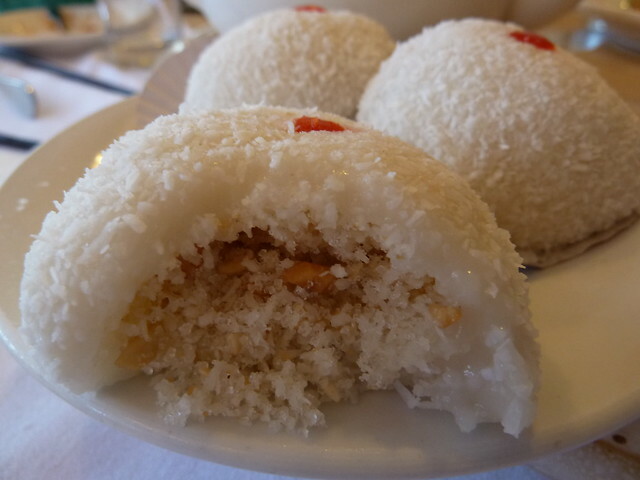 They are soft glutinous rice dough with a filling of chopped peanut, coconut and granulated sugar. 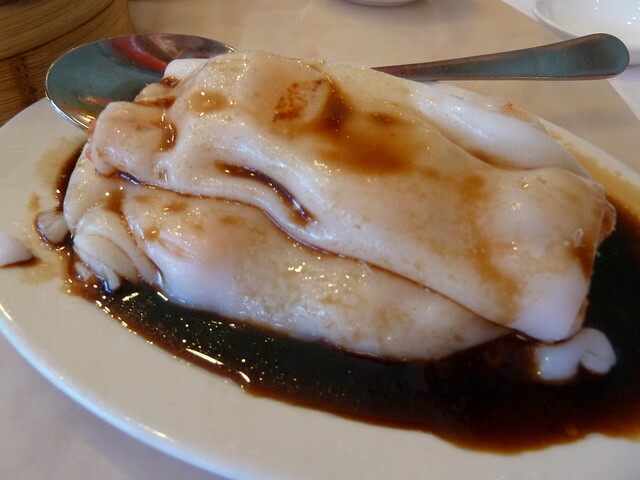 These skins were so fresh, they almost melted on your teeth, collapsing and inducing much undignified stuffing of bao into mouths. 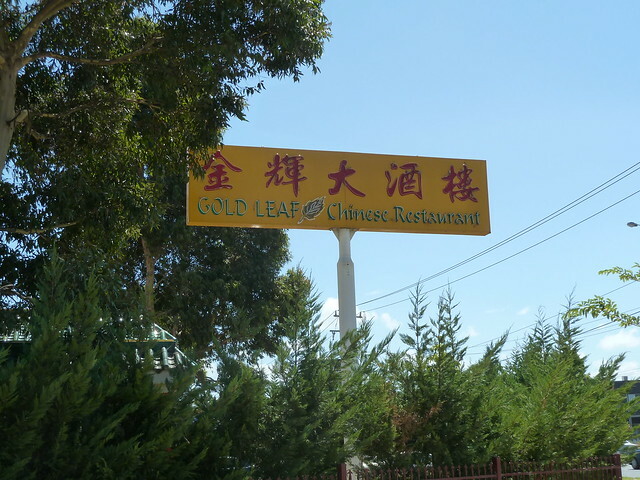 Gold Leaf is busy and colourful, innovative and progressive yet still stays true to its roots - a bit like the western suburbs, I guess. 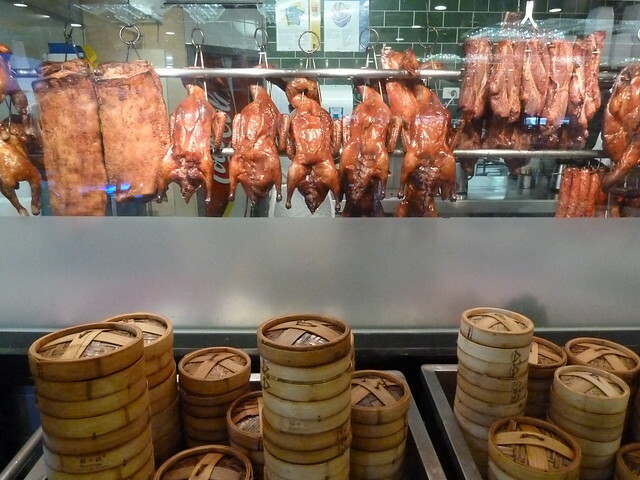 Yum cha daily - prices $5.30 - $11.00 per plate. Some eateries are superheroes - when evening falls, they step into a metaphorical phone box and transform themselves from standard sandwich bars or cafes into Nepalese or Thai restaurants and the like. This double identity can be challenging, though. Often customers aren't aware of the establishment's flipside and so it suffers from lack of patronage. Other times, maybe they over-reach. Still, there's such a thrill on browsing a menu you think you've got figured out before you read the second line and some exotic dish jumps out and ambushes you. 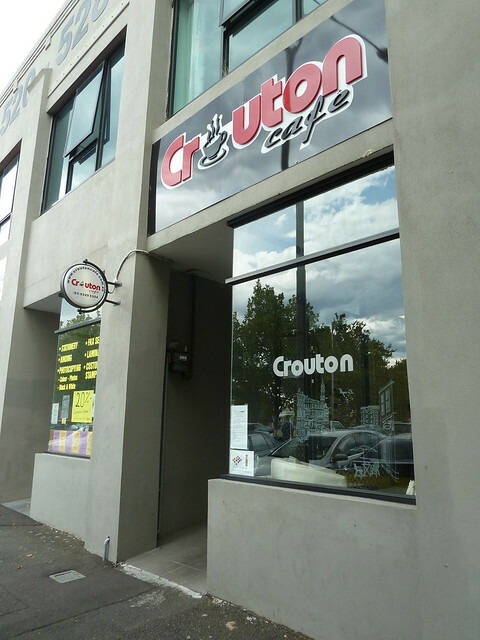 Crouton Cafe is a small, workday cafe that offers a Mauritian menu at Saturday lunch only. Mauritius is a small island nation to the east of Madagascar, off the southeast-African coast. It was apparently uninhabited until the early 1500s (apart from dodo birds!) and waves of Portuguese, French, African, Indian and Chinese settlement have produced a truly multicultural, creole cuisine. The British ruled Mauritius from 1810 to 1968. Slavery was abolished in the early 1800s and, as occurred in Malaysia, Britain imported indentured labourers from India to work the sugar fields. This dish takes up the Indian thread in Mauritian creole cuisine, featuring a chewy flat bread similar to roti filled with turmeric-scented stewed vegies. This was tasty but the vegie curry was very oily - the oiliness could indeed be authentic, though. 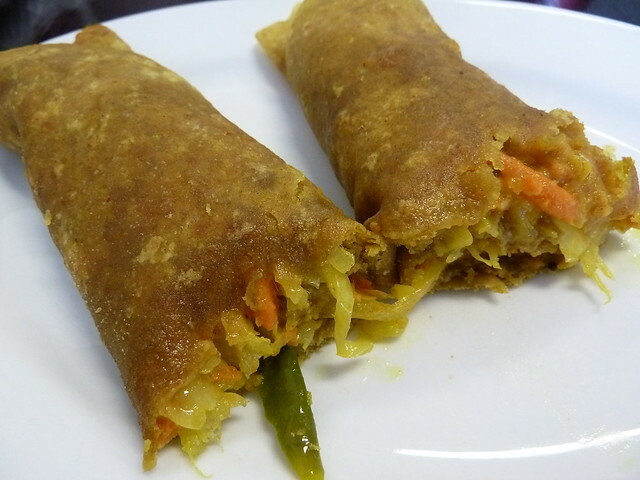 See more about Mauritian street food here. 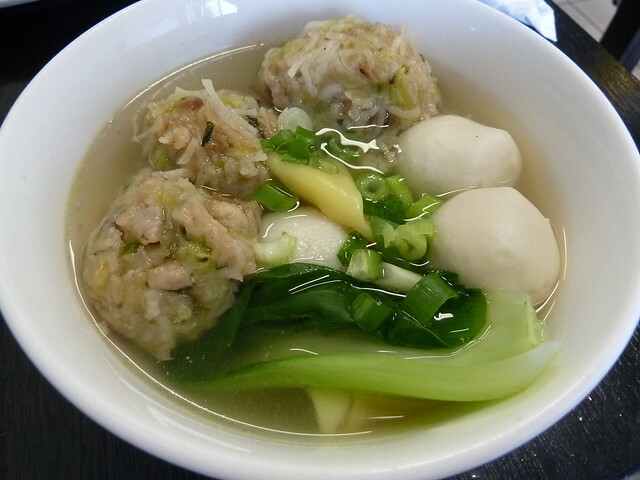 Crouton Cafe offer a choice of "bol" (short for boulette, I believe) which are various ball-shaped goodies in soup, such as fish balls, bol chou chou (choko balls), and wontons. We got to try all three in this mixed dish. The fish balls tasted like standard fish balls you would get at a Malaysian restaurant - bouncy and fresh. 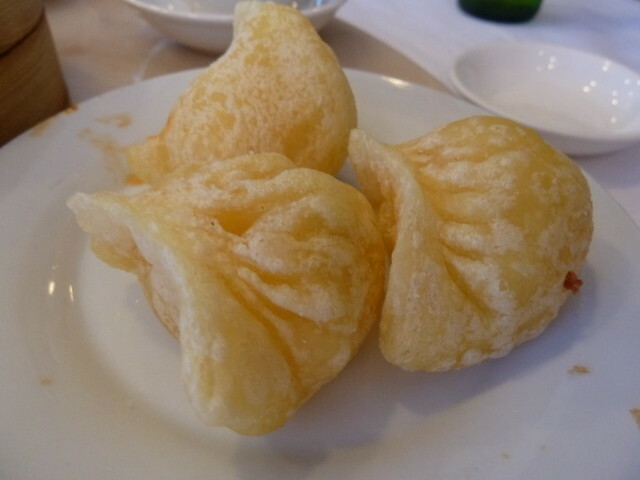 The wontons were quite dense and the pastry a bit overdone. The bol chou chou were pretty good, balls of rice, a little mushroom and green choko. I'm pretty sure the stock was powdered - it was really just a vehicle to suspend the bols in. This was recommended but after the rice in the bol chou chou, I wished we had tried the haleem or lamb curry for something different. It came covered with the omelette like a little blanket, perhaps harking back to this Mauritian dish, bol renverse ("upside-down bowl"). 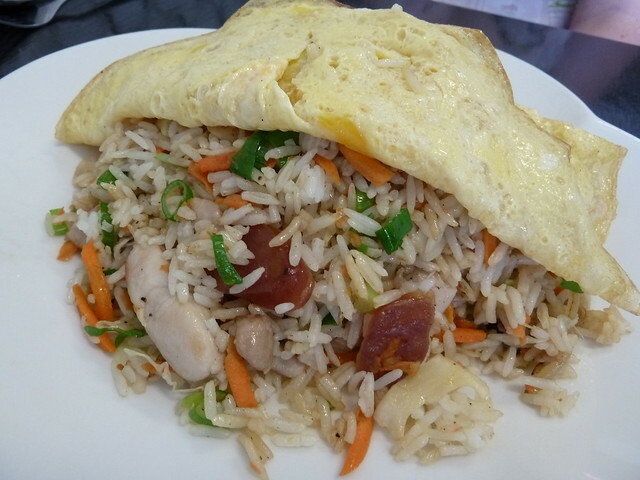 The rice was quite nice with chicken, Chinese sausage and carrot with light soy flavour but unless it's Vietnamese fried rice with salted fish, I'm probably a pretty hard customer in terms of fried rice. I'm not sure what to make of our meal. It was fun to try something different and the staff are lovely, but I think I might have gone for the wrong combination of dishes. 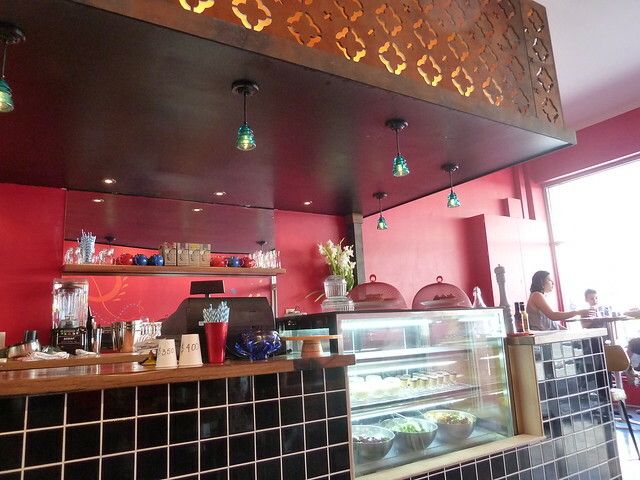 Compared to when I first spied this place, I am pretty sure the Mauritian menu has been pared back - maybe they don't get enough customers because of their everyday-cafe outward appearance. Still, if you're passing by, the prices are low enough to take a punt. 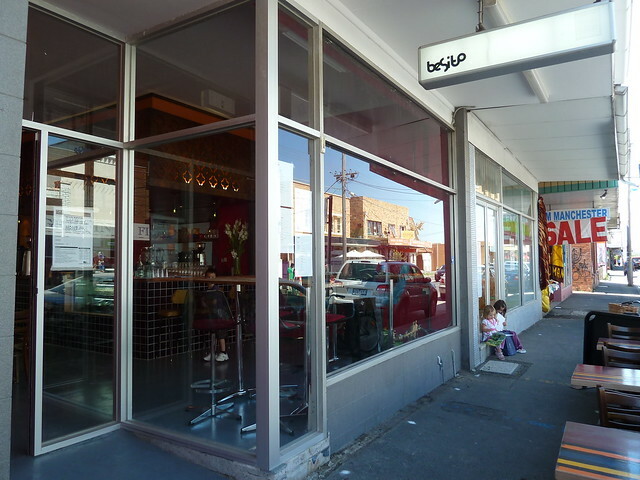 Also just opened at 20 Wembley Avenue, Yarraville, is Cup and Bean, a coffee-centric cafe and greengrocer combo serving Cartel Coffee out of Geelong. 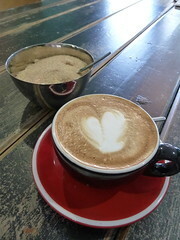 Sadly I didn't love my latte but I am of genus fussus pottus when it comes to coffee, so do try it out for yourself. The owner is very passionate and a sandwich, freshly made from produce straight from the fridge and on house-baked bread, was fab. See more at Consider the Sauce. 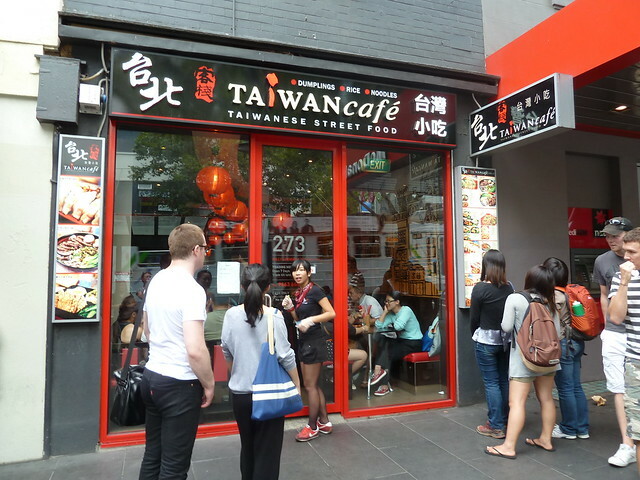 If the queues out the door of this tiny Swanston Street spot are any indication, Melbourne can't get enough of Taiwanese at the moment. We carpe diem'd at a momentary lull and got the last table right away. 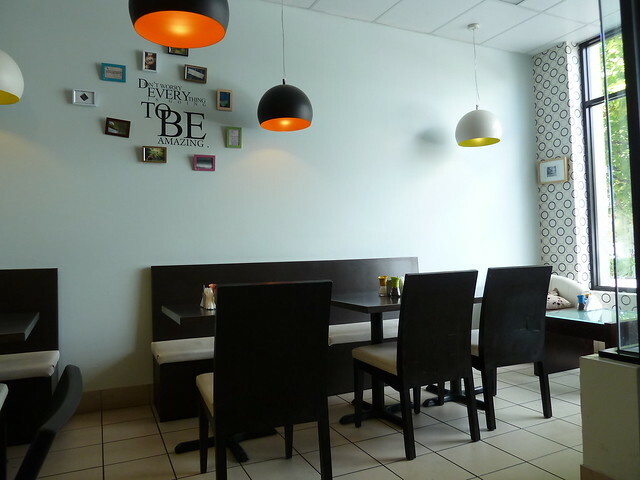 It sure is tiny inside, with tables just a hair's breadth apart. I don't mind eating like this if I'm in the mood - the busyness creates a real buzz, and the dark decor here adds to the sense of cosiness. 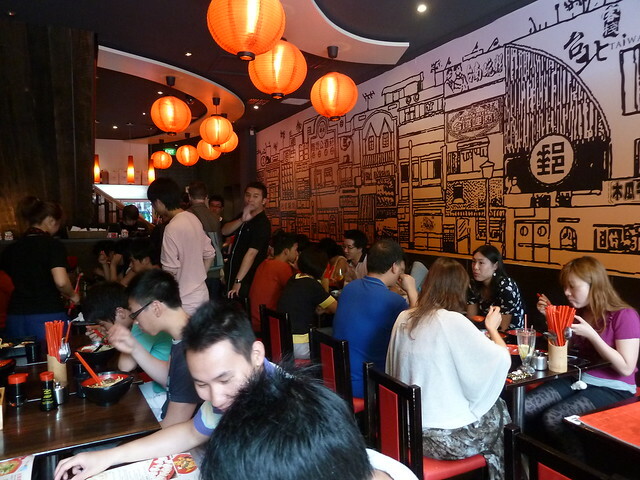 The lanterns and wall art give a feel of winding through a busy Taipei backstreet in search of great eats. 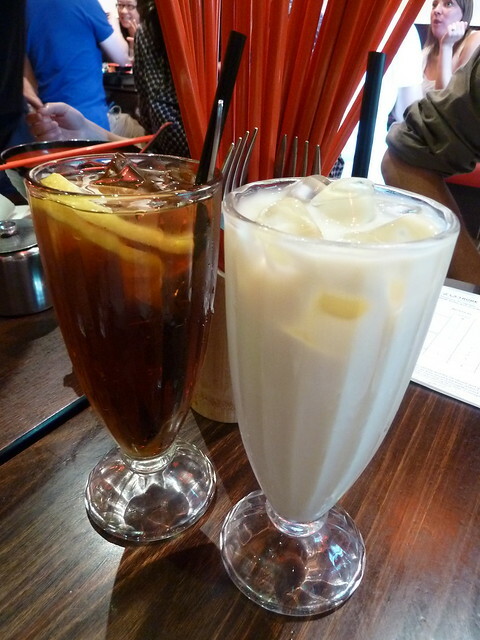 Over gorgeous fresh soy milk and lemon tea, M broke it to me. He's joined the good guys - he's gone vegetarian. NOOOOOOO!!!! Where has my cartilage-chewing, bone-nibbling, stock-dribbling eating buddy gone? Sigh.......... It's cool. We can still be friends. Just... I can't do vegetarian ma po tofu. I just can't. This Ma Po Tofu was yummy with cloud-like silky tofu pieces with a light sauce, tasty pork mince, lots of black pepper and chilli. The "thing" here, however, is the range of bento-type boxes with rice (dressed with a little pork mince), greens, fried egg and something fried to outrageously golden crispiness. I tried, I really did, but I just have to have some time away from batter. Those jeans aren't gonna shrink themselves. The menu helpfully picks out the recommended dishes, but when you order one that doesn't have the little stamp of approval, it's with trepidation. These vegetarian noodles were one such unmarked. 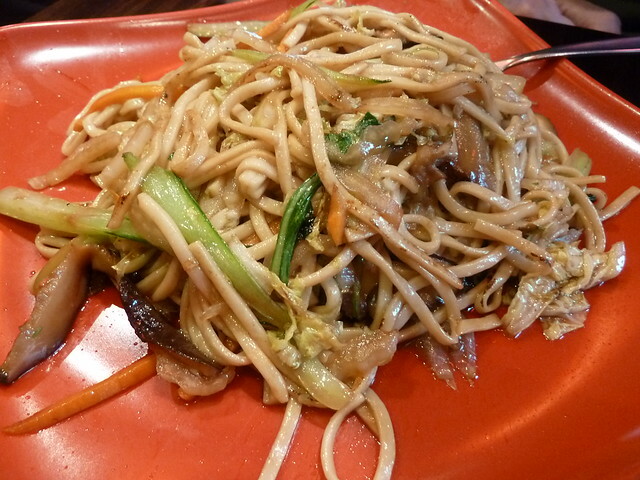 They were of good consistency and flavour but the total lack of wok hei made them a bit tedious. Their pork dumplings, apparently a specialty, were merely acceptable. The mince was not very juicy and it was slightly grainy. 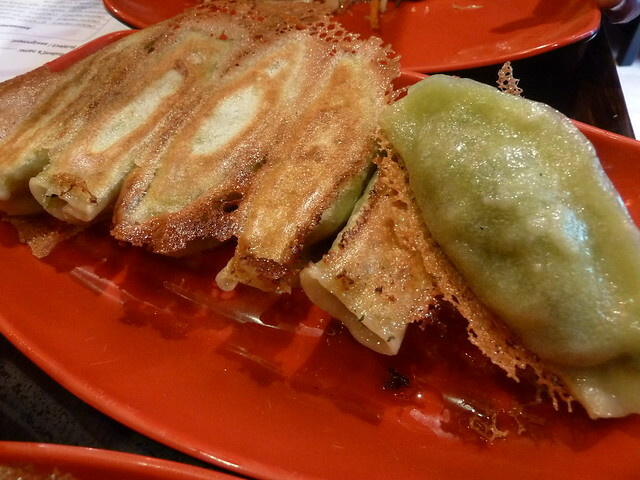 Far better at Shanghai Street or next door Dumplings Plus. Their vegetarian counterparts were quite horrid unfortunately, with muddy, underseasoned spinach and not much else. At least we found some common omnivore ground in the spring onion pancake DMZ. This was great with a flaky, roti-like texture. 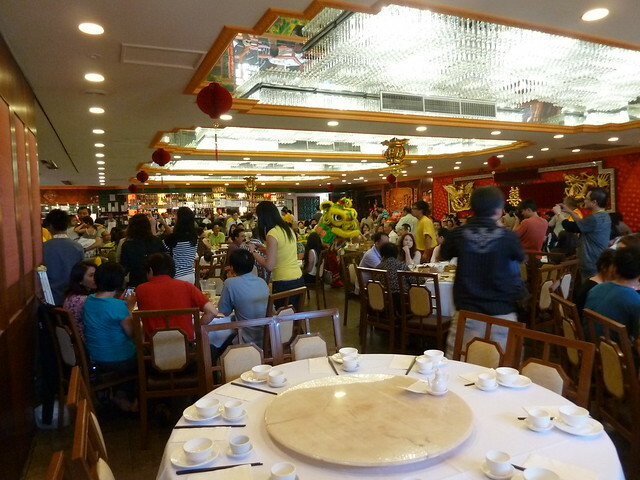 Taiwan Cafe isn't a very vego-friendly restaurant which constrained our ordering. 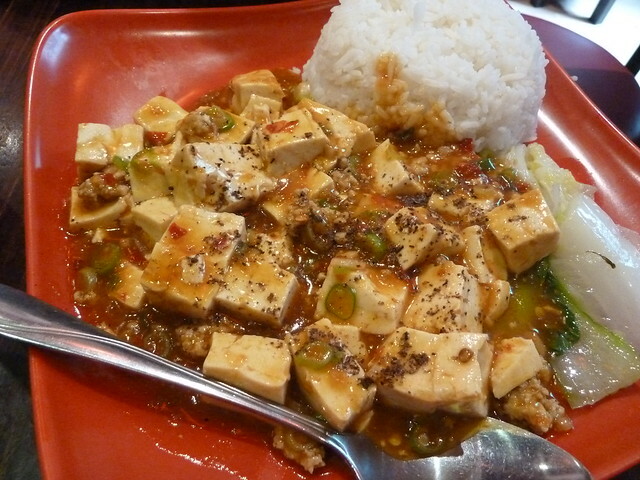 I enjoyed the ma po tofu a lot and am keen to try the fried offerings when I'm out of elastic waistband territory. Taiwan Cafe is hot but a commitment in the face of all this deliciousness to karma-free eating is decidedly hotter - well done my friend.